Sometimes when it seems like everything in life is completely up in the air, the best thing to do is gather round a table with those who help us stay grounded. I’ve always loved the phrase “gather round” because it so succinctly captures of being surrounded by a loving essence and holding it in the time honored power of the circle. 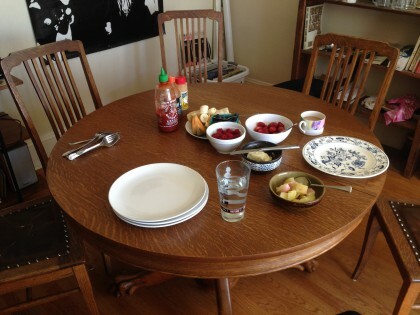 I was very fortunate last week to be able to do that in Portland, and around my old oak table (which you can read about in the post Turning the Tables), now gracing the dining area of my second son Bobby’s house out in St. John’s. We gathered for a Saturday brunch. We got to meet his lovely new girlfriend, and another dear friend and former room mate who owns a home around the block with him is now my real estate agent in Portland. She came with her boyfriend, who is also from north Idaho. So I got to gather round my old table with a cluster of wonderful young people, all beginning or about to begin their 3rd decade. 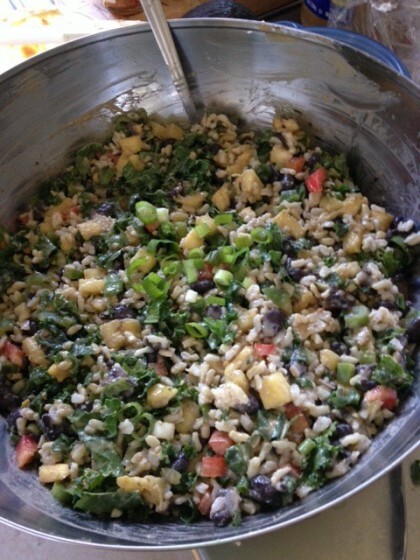 I made a salad version of Susan’s African Pineapple Peanut Stew to bring to the gathering. 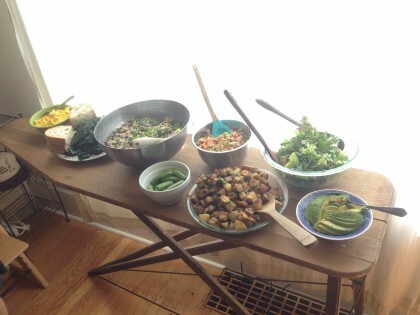 It was an eclectic mix of the basics of her recipe and what we had in the fridge. Instead of chickpeas, we used black beans. We added red and green bell pepper and more garlic and used fresh pineapple. A version of the peanut butter sauce became the salad dressing. 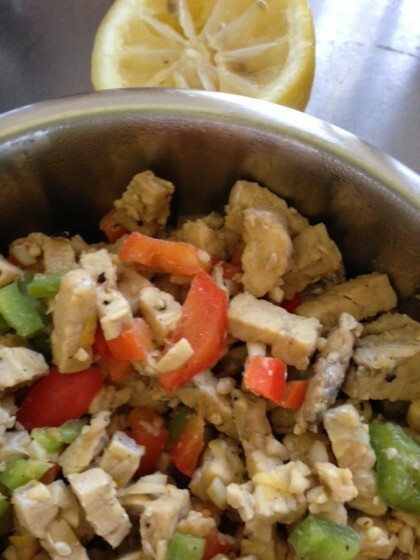 And Mike cooked up some yummy tempeh made bright with lemon zest, pepper, peppers and garlic. But the real gift was to see the thoughtful spread on an antique ironing board and my old table prepared by our hosts, which included things Laura and Bobby knew I could eat. They steamed some kale from the garden. There was a bowl of fresh fruit. And along with the pan fried hash browns, there was a bowl of steamed potatoes (you can see these in the photo at the top of this post). I ate them all. At the moment I am writing this post, I have no idea where I will be living in Portland, and the buyer for me house in Moscow has not signed off on the inspection just yet. My life feels literally up in the air. So I was especially grateful to see Bobby so nicely ensconced in his new home, painting the front bedroom, building a deck out the back door, and enjoy his first vegetable garden ever. We had some of his first raspberries of the season in our fruit bowls, too. I was also reminded of the mystery that opens up when we excavate the old, hoping to create something new. Bobby opened up a wall to a small room just off his kitchen to make more open space and maybe a breakfast nook. In this process he discovered some small boxes inside the wall holding the newspaper obituary of someone who may have lived in the house back in the 1930s, a telegram that mentions his passing and the date, and a pile of tiny cards from flowers that were given to the family as condolences, notes of sympathy written in the careful cursive penmanship people once prided themselves on, decades before we all began typing on screens. As we pondered his findings, I asked Bobby what he planned to do with them. He said he thought when it was time to finish up the new wall that he would put them back in, with a note about himself and how he found them and when, to make a kind of time capsule for someone in the future. That sounded perfect to me. Sometimes we simply don’t know what the future holds. We make our plans and hope for the best, but often those plans lead us into more unexpected mystery. It’s not always easy to let mystery reign, but honestly there’s not much to be done but respect it’s ability to hold us in sway. When I fall headlong into mystery, experiences of gathering like this remind me that it’s the people and the love and the richness of each moment that make life worth living, not the things that accompany that, even the houses, nice though they may be. I have been blessed with owning two incredibly sound and cozy homes. I hope the third one, though it may be the smallest of all, will hold the magic of the saying “third time’s a charm.” I’ve always had a little magic on my side and great help from all my angels, both human ones and more ethereal ones. So I’ll take the experience of a lovely meal with this younger generation as a blessing along my mysterious way to wherever I am headed. It was a true welcome into the arms of Portland. The African peanut salad is a really great take on the stew! Perfect for the summer months when you don’t want something as heavy. I think I will make something like that, too – thanks for the idea. I’m keeping my fingers crossed for the house sale to go smoothly, and that you find your perfect “third time’s a charm” home in Portland. It’s a fantastic city that I always love to visit. And it’s perfect for someone who has to eat the way we do – many options and very little judgement. West Coast cities rule! This looks so yummy! Do you have recipe or should I try to improvise off the stew recipe also? I really enjoy your posts and want to say welcome to Portland! Best wishes as you settle in. Thank you Christine! And thanks for the warm welcome to Portland, too. I have been in such a whirlwind that unfortunately since I didn’t write down exactly what I did when I did it, I could not guarantee a recipe. It was about 1/2 cup of peanut butter for the sauce, a combo of pineapple and lime juice and water for at least an equal amount of liquid to thin it out to desired consistency (probably more), garlic and something hot like tabasco or chili powder. . I may also have put tumeric or cumin, but this is where my memory breaks down. It was sort of an “add and taste until it’s right kind of deal! I love how you’re celebrating your family and friends in Portland even before you move there. I agree that it is the people who make our experiences much more than the space. Good luck as you continue this transition. Thanks Pam. I’m prone to finding how to celebrate what is available, and then I end up feeling quite rich!! I appreciate the good thoughts as I continue on with this huge transition. Sorry. Did I miss something? I can’t find the recipe for this salad. Sometimes I feel so clueless! Welcome jem2! You did not miss a thing. In the midst of my transition, I was unable to write down an exact recipe, so I only directed readers to the link to Susan’s original stew, and wrote a little about what added or subtracted to make a dressing. My apologies for not being able to remember what I did exactly enough to write a recipe for you!! I didn’t realize that you were on the cusp of such change, Maria! I love the way you frame it here. Transition and uncertainty can be difficult to navigate, and I think you have a beautifully positive and open attitude toward your upcoming move. I’m so glad that you’ll be near family and friends. Thanks, too, for bringing me back to the first “turning the tables” post. You’re right, we talk a lot about downsizing and minimizing objects in our lives, but possessions can have tremendous symbolic importance (after all, why else would it sometimes feel so major to give them away or let them go). I love the idea of passing a table–a very real symbol of family history–on. And I love that recipe of Susan’s! Thanks for this lovely comment, Gena, and for taking the time to read both “Turning the Tables” posts! Yes, I am in the midst of very big change, and attitude makes all the difference, I’m finding. I’m enjoying each minute of this adventure as best I can, but it will be nice to settle in somewhere and really catch up on my blog reading. Thanks for visiting me here! Hi Maria, what a lovely family get-together! I’m with you: When the going gets tough, I circle the wagons around the dinner table with my family and enjoy nourishing food. Hope all goes well with the house sale and that you’re settled in Portland soon. Been thinking of you!